This Dude has a completely different opinion about Moslims, check him out, haha! 'Who hijacked my religion? No, but seriously, who hijacked my religion?! '...good question Dude! For those that are wondering now why they should still like Holland, here's a summary from 'Long Frans', it's all good! For those that are already done with liking Holland, here's the version of this song from Salah Edin, the man that Geert shows incorrectly in 'Fitna' as being Mohammed Bouyeri, the killer of Theo van Gogh, just a little honest mistake, they all look the same anyway, don't they Geertje? To make the most of your time trapped inside, you could view this movie that pretends to be a part of 'Fitna', the controversial film that Geert Wilders has produced, and that has caused a lot of commotion, even though nobody has seen it yet! What do I personally think of Geert?! 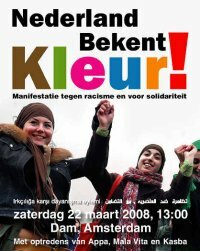 This Saturday there's a big demonstration on the Dam square in Amsterd@m, against racism (officially) and Geert and his Movie (unofficially), for a multi-cultural society and solidarity (not with Geert, I guess), go there if you dare! The world's financial systems are behaving like butter on a hot Summer day lately, and some people are wondering why this is and how it could have come this far (besides the fact that the U.S., the worlds biggest economy, is guided by a total Retard of course)...if you'd like to understand more about the current situation, you should watch the Movie Zeitgeist, it contains some interesting information that might shed light on the question where your money is disappearing to! Geert has said many things about the Islam&Koran that did not go down too well with Muslims worldwide, now they want to chop off his head and our Government thinks it's his own fault and he deserves it, because he made a movie that supposedly insults every Muslim everywhere. This is called 'Freedom of Speech', he says something and others are free to say he's an Idiot and his head should be chopped off! 'Freedom of Speech' is an old fashioned thing that you will soon only read about in history books, thanks to people like Mr.Balkenende and their way of dealing with threatening situations, this is called 'Appeasement' and worked really well when applied to Hitler and his way of 'bringing home' European countries that didn't really feel like they belonged to Nazi-Germany! In case that you are a bit worried, luckily Amsterd@m has become a real Cop-City, I feel much better now, I really do! There is a simple evolutionary reason why I can do that while others have to wear Winter clothes! "Now just as mankind is the most perfect of all animals, so within mankind the man is more perfect than the woman, and the reason for his perfection is his excess of heat, for heat is Nature's primary instrument. ... The woman is less perfect than the man in respect to the generative parts. For the parts were formed within her when she was still a fetus, but could not because of the defect in the heat emerge and project on the outside."